Pepper has been deployed in 120 Renault car dealerships all over France. Its job is to welcome people, promote car ranges, collect customers information in order to book a personal appointment and also propose a quizz about in-car technologies. More info here. Deployed in 6 agencies Pepper gives informations about the banking services provided by AXA while customers wait for an advisor. The robot mainly helps people about day-to-day operations. People can also play interactive games with Pepper so they don’t realize they’re waiting in line. 2015 was an amazing year for Carrefour Group, Softbank Robotics and Intuitive Robots. The international retailer was the first company ever to deploy Pepper in Europe, in three stores in France and two in Spain. 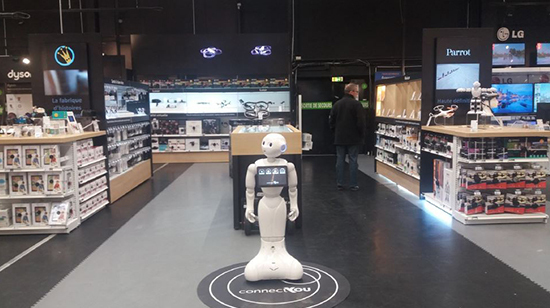 7 robots per store, strategically located with applications to promote products and entertain people. 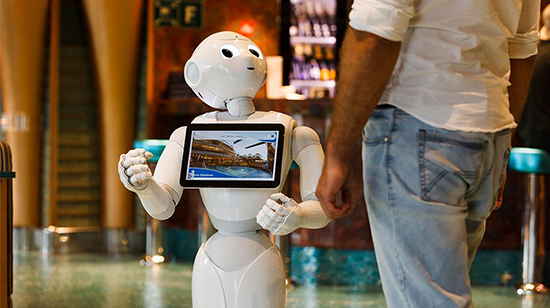 Since 2016, Pepper is deployed in 5 cruise ships to inform and entertain guests. Whether you are looking for an excursion, an on-board activity or the location of your room, just ask Pepper! Additional information in the following press release. Pepper has been working for Westfield for few months. The robot helped shoppers to find their directions and collected customer feedback. During this experience, +10k customers were directed to stores. Read the full case study from SBRA.